February 20 is the World Day of Social Justice, so proclaimed by the United Nations General Assembly in November 2007 in recognition of "the need to consolidate further the efforts of the international community in poverty eradication and in promoting full employment and decent work, gender equality, and access to social well-being and justice for all." From the Bahá’í perspective, justice is paramount. Bahá’u’lláh, Founder of the Bahá’í Faith, plainly stated that "no radiance can compare with that of justice. The organization of the world and the tranquillity of mankind depend upon it." In expounding on the teachings of His Father, ‘Abdu’l-Bahá explained that "the canopy of existence resteth upon the pole of justice, and not of forgiveness, and the life of mankind dependeth on justice and not on forgiveness." During His ministry, in the latter half of the nineteenth century, Bahá’u’lláh wrote that "the world is in great turmoil, and the minds of its people are in a state of utter confusion. We entreat the Almighty that He may graciously illuminate them with the glory of His Justice, and enable them to discover that which will be profitable unto them at all times and under all conditions." Directed toward the individual, Bahá’u’lláh also wrote "O son of man! If thine eyes be turned towards mercy, forsake the things that profit thee and cleave unto that which will profit mankind. And if thine eyes be turned towards justice, choose then for thy neighbour that which thou choosest for thyself." And so it is, with faith in the transformation of the individual and the community—local, regional, national, and international—that is possible through application of Bahá’í teachings such as those concerning justice, that Bahá’ís are working tirelessly to assist in effecting change for the betterment of the world. The Bahá’í International Community statements "Guiding Principles on Extreme Poverty and Human Rights" and "Human Rights and Extreme Poverty" are written from the Bahá’í viewpoint that the purpose of justice is to establish order in the world, promoting unity and fellowship among its peoples. In a publication by the Bahá’í World Centre, read about the concerns of an age awakening to the need for justice and about the role of justice in the order of civilization. 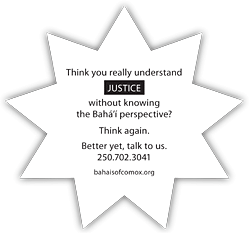 For collaborative study of justice and other topics, please call the Bahá’ís of Comox (250.702.3041).